In a nutshell, here are some of the potential threats and dangers associated with UCG, CBM and Fracking. Fracking, Coal Bed Methane Extraction and Underground Coal Gasification could eventually impact up to 60% of the UK. UCG, CBM and Fracking could potentially cause dangerous pollutants to contaminate the groundwater and land as well as leading to increases in air pollution and CO2 emissions. Recent evidence from the British Geological Survey and Environment Agency shows that 95% of oil and gas shales underlie drinking water aquifers, meaning that if leaks occur, which they often do, water supplies could be contaminated. The leaking of carcinogenic and radioactive materials such as Radium, Benzene, Toluene, Arsenic, Cadmium, Lead and Mercury have been linked to Fracking, CBM and UCG energy production. The UCG, CBM and Fracking processes all potentially create considerable noise and visual pollution problems. 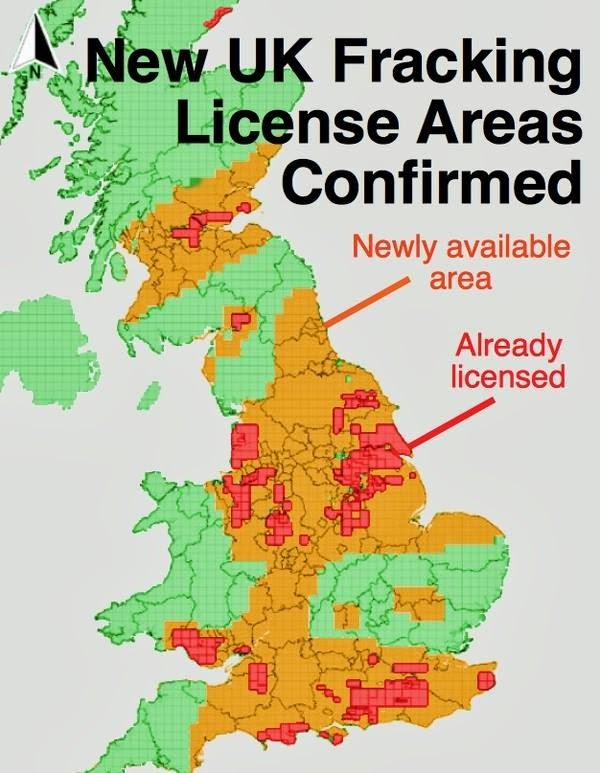 Laws are currently being passed in the UK to enable companies to frack, burn coal seams and extract methane directly under people’s properties in our towns, villages and rural areas. The Fracking and wastewater disposal processes (which are also carried out on a considerable number of CBM sites) have been linked to increased seismic activity and earthquakes. In 2011, Fracking in Blackpool was determined to be the ‘probable cause‘ of two earthquakes in the area. This could have negative consequences on house prices and homes may not be insured for natural disasters, contamination and subsidence related to fracking. Approximately one third of the Wirral’s land area is used for agricultural purposes. Recent figures from the Agricultural Census indicate that up to 1,800 hectares of land are used for arable production and that there are over 7,000 head of livestock and 64,000 poultry present throughout the area. Agriculture is, therefore, still of considerable significance in terms of its impact on the local economy. UCG and CBM could have devastating effects on the agricultural industry in the region if water and land becomes contaminated. Toxic chemicals were recently found in the fat of grazing animals near a UCG plant in Australia, forcing the operation to be shut down. The Wirral enjoys a diversity of animal and plant species including Atlantic grey seals, natterjack toads, great crested newts, rare birds and lizards, mammals and dozens of species of unusual plants and invertebrates. This ecosystem is very vulnerable to the risks of water and land contamination. Many of these animals are very rare and protected by British and European laws. Increased water temperatures due to burning the coal-seam underground could alter the natural habitats of marine plants and animals, which would have knock on effects for the entire natural ecosystem. There will be increased traffic on our roads to service the wells with water and chemicals. The infrastructure and road systems on the Wirral are already struggling with existing amounts of traffic and accidents could increase. The tourism sector in the Wirral contributes over £310 million to the economy, creates over 4,000 full time jobs and attracts 7 million visitors each year. UCG and CBM will have a major visual impact on the natural beauty of the Wirral as thousands of drill rigs, production plants and miles of pipelines will need to be built in the area. Industrialisation of our countryside could therefore cause this important part of our economy to dwindle and we could lose far more jobs than we gain from the process. Most of the jobs created by UCG, CBM and Fracking will not go to local people anyway. If water, land and air quality are effected then this could be even more problematic for the tourism sector in the region. Our beaches, country parks, golf courses and outdoor environments could become industrialised. Who wants to go on holiday in a gas field? Increasing CO2 emissions has potentially devastating consequences for the future of our planet. Fracking, UCG and CBM are expensive, extreme, dirty and short-term. Burning yet more fossil fuels will only exacerbate the problem that we are leaving for future generations to deal with. At some point we need to face up to this. Investing in UCG, CBM and Fracking takes important resources away from the more challenging task of creating a sustainable energy future for our country and planet.